The MSR210D Keyboard Interface Magnetic Card Reader is ideal for retail, time keeping, security and the card reader related systems. 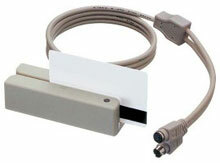 The MSR210D series are designed to offer the user a card reader solution that will complement many applications. Triple track MSR210D reader is uniquely designed to read debit/credit/loyalty cards and driver licenses based on American Association of Motor Vehicle Administrator and California standards. The UIC MSR210D-33AHKNR is also known as MSR210D-33AHKNR	or MSR210D33AHKNR	.